Is it possible to have too many toys? My kids don't think so. I disagree. I can totally relate to the book by David Shannon, Too Many Toys. I get overwhelmed by how many toys we accumulate. From presents and prizes to holidays and hand-me-downs we have run out of room. I have a hard time keeping up with rotating age appropriate toys; what do you do with their baby toys when they are preschoolers? Don't even get me going on the uselessness of stuffed animals (I have a great idea for storing them I'll share in a future post). A funny point it makes in the book is that parents hold on to toys too. My husband still displays Star Wars Legos and Potato Heads in our bedroom. And I'll admit I have my own share of toys I've hung onto (the Dr. Seuss obsession is really more mine than the kids). Do any readers have special toys they've kept, or they still collect? What tips do you have for toy storage/rotation/management? With so many toys I often wonder why kids say they are bored and why they, like Spencer in the book, end up being completely content playing with a box instead. Too Many Toys? We need to simplify. The day we built our shed the kids played in the box all day. 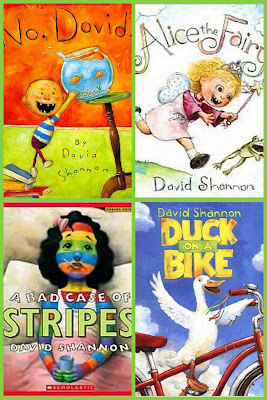 ﻿David Shannon is one of our favorite authors. His book, No David, won the Caldecott Honor in 1999. My daughter adores Alice the Fairy and our son loves the David series and Spencer (from Too Many Toys). David Shannon was interviewed by Barnes & Noble where he listed one of his 10 favorite books as The Five Hundred Hats of Bartholomew Cubbins by Dr. Seuss. Shannon said, "I like stories about events that start small and gradually get way out of hand. I think that this book has influenced my own writing." 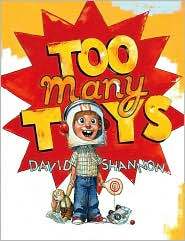 You can watch a video of David Shannon reading the first half of Too Many Toys online at Scholastic Books.